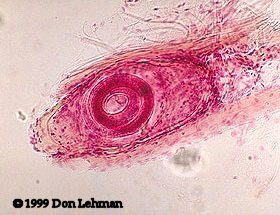 Trichinella spiralis is a tissue nematode humans acquire by ingesting improperly cooked meat, particularly pork. After ingestion, the larvae enter the intestinal mucosa and mature into adults. The adults mate and larvae are produced. The larvae make their way into body tissues, particularly active muscles. The larvae then encyst reaching lengths of 0.8 -1 mm. This image is from a muscle tease-prep.